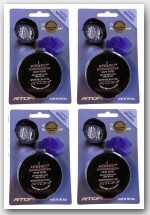 some of the wonderful new items that we have in stock at Indoor Storm. 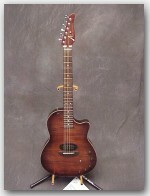 I'm sure that everybody is familiar with the "plugged in acoustic player's dream" - The Tom Anderson Crowdster. Now Tom has expanded this solid body style acoustic to a Crowdster Plus by adding a mini humbucker in the bridge position. with 3 mini humbuckers and a Bigsby - This version of Atom is so versatile it's like having Gibson, Gretsch, and Fender all in one package. On an even more retro note, our friend Jerry Jones has started building the "Dolphin Nose" version of the 6 string bass again. 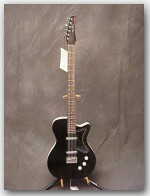 This model is tuned "E to E" an octave below, has "6 on a side" tuners, and is hollow. Jerry's instruments are normally chambered and are incredibly resonant and the "Dolphin Nose" is actually hollow so she is ready to jump out of your lap !!!! On another bass related note, we have had a great time checking out the new Line 6 LD-150 Lowdown Bass amp. 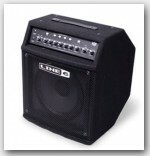 The LD-150 packs 150 watts with 1x12" and some wonderfully musical tones and effects in a small package. Click on the pic to see the amp! 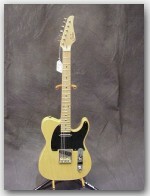 If you have been searching for a great t-style instrument we have the Suhr Classic T of your dreams. Swamp Ash/ Maple in Trans - Butterscotch (even one with the new '50's round neck shape), and a wild Three Humbucker model with a reverse headstock. These are so good one of these will make you forget how to spell your name !!!! Click on the above pictures to see and hear each guitar. Speaking of portable, the new Fender Jazzmaster Ultralight is unbelievable. The head with it's companion 1x12" cab weighs a total of about 10 lbs. Rated at 250 watts at 2 ohms the Jazzmaster ultralight is more than just a practice amp. I know what you are thinking -"It's a solid state amp - what are you crazy ?" There are two channels - clean and dirty with separate effects for each channel. 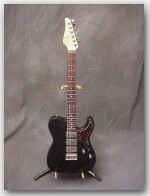 The clean channel has a "voice button" that allows you to choose between a warmer jazz tone or a more Twin style tone. The real killer is the overdrive channel -amazingly sweet with a real round singing tone - this is not your Dad's solid state solo tone !!! 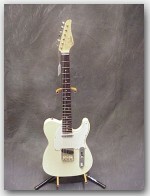 We have had tele/modern country players play it and love it as well as big jazz box players. One of the jazz guys told me he could now sell his 4x10" combo and his truck that he used to transport his gear, boy is that using your head !!! Featured Product of the Month!! 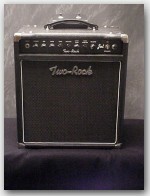 Another smaller more back friendly combo is the Two Rock Jet . Holy Cow !!!!! Thirty watts with reverb/channel switching/2 6L6/12-65 speaker is like a mini Custom Reverb Signature - this amp is so alive you won't believe it. The clean channel is so input sensitive that you might not ever need to go to the dirty channel. It is so responsive it really feels like an extension of your instrument and your touch. A truly great amp. If you have any questions on these or any of the other wonderful products we are fortunate enough to offer please let us know. We can be reached Toll Free at 1-877-319-8473 or via e-mail at sales@indoorstorm.com. Our business hours are 11:00am-7:00pm EST Monday Thru Friday, and 11:00am-5:00pm EST Saturdays.